At the center of the Sun is a raging nuclear inferno that reaches temperatures well into the millions of degrees. The surface is cool by comparison, at 10,000 degrees Fahrenheit. Then up in the corona—the golden haze that can be seen around the Sun during a total eclipse—the temperature shoots into the millions again. And no one knows why. We might be on the verge of finding out. In little more than a month, a NASA spacecraft will come closer to the Sun than any mission before—more than three-quarters of the way there—and it is just getting started. Laden with scientific instruments, the Parker Probe will continue to circle closer and closer, finally getting within a few million miles of the Sun in 2025. If you imagine the 93 million miles from here to the Sun as a football field, the probe will make it inside the 4-yard line, the agency says. And it won’t melt—more on that below. The goal is not just cool science. The mission is expected to reveal much about mysterious high-energy particles that periodically spew forth from the Sun at thousands of miles per second, posing a risk to satellites, the power grid, and the health of astronauts. Among the many scientists involved in planning the mission were David J. McComas, a professor of astrophysical sciences at Princeton University, and Bill Matthaeus, a professor of physics and astronomy at the University of Delaware. The puzzle of the corona—the layer of atmosphere that begins 1,300 miles above the Sun’s surface—has long been a special focus for Matthaeus. Why would the corona’s temperature reach millions of degrees—a fact we know from using instruments called spectrometers—when the Sun’s surface below is only in the thousands? “I like to tell people: ‘What would you do if you lit your campfire or a fire in your fireplace, and as you walked toward it, it got colder? '” Matthaeus said. His preferred theory starts with roiling, turbulent motion that occurs in the photosphere—the gaseous layer that we perceive as the yellow “surface” of the Sun. This turbulence interacts with magnetic field lines that radiate out from the Sun, plucking them almost as if they were guitar strings, he said. The resulting waves travel outward, then are reflected back, leading to a cascade that heats the corona to fantastic temperatures—fueling another phenomenon called solar wind, according to his explanation. Other scientists have proposed different theories. Four suites of instruments on board the Parker Probe are expected to help answer these and other questions. Princeton’s McComas is in charge of one group of instruments that will detect electrons, protons, and other energetic particles emitted by the Sun during chaotic events such as solar flares. The measurements will be stored on solid-state data recorders—fancy versions of flash drives—then transmitted back to Earth by antenna when the probe’s looping path takes it away from the Sun’s intense heat. These high-energy particles are a key element of “space weather,” with the potential to disrupt satellite communications, the power grid, and even the GPS feature in a smartphone. With enough warning of such events, technicians can place satellites into safer states, McComas said. Like Matthaeus, the Princeton physicist is burning with curiosity about the Sun’s three big mysteries: the hot corona, the solar wind, and the energetic particles. But asked which theories might explain these phenomena, he demurred. So how will the sophisticated instruments survive those million-degree temperatures? The answer has to do with the difference between temperature and heat, and the fact that the Sun’s corona, though hot, is very low density, NASA says. Temperature is a measure of how fast particles are moving, while heat refers to the amount of energy that is transferred by those particles. In the Sun’s corona, particles are traveling at high speed, but there are few of them, so relatively little heat can be transferred. 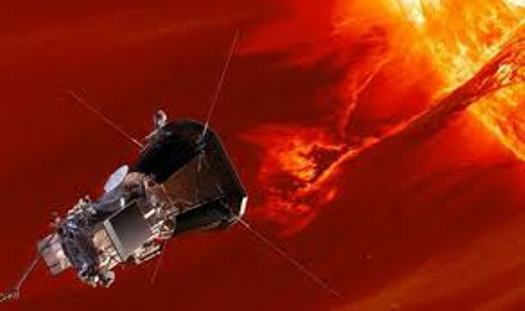 Agency scientists predict that exterior of the Parker spacecraft will be heated “only” to a temperature of about 2,500 degrees. That is still hot enough to melt many metals. So the craft is protected by a heat shield—a carbon composite foam sandwiched between two carbon plates, designed at the Johns Hopkins Applied Physics Laboratory. Betsy Congdon, the lead thermal engineer for the heat shield, demonstrated its effectiveness in a NASA video, heating one side with a blowtorch while a colleague calmly touched the other side with his bare hand. With protective shield installed, the Parker Probe was launched at 3:31 a.m. on Aug. 12, carried aloft by a thundering Delta IV Heavy rocket at Cape Canaveral, Fla.
McComas and Matthaeus were among hundreds on hand for the awe-inspiring sight.